A Los Angeles electric school bus being charged. Interest in electric, however, is expanding across the U.S. Legislation heads to Gov. Larry Hogan’s desk that would formally create a $600,000 grant program to assist school districts in adding ZEVs to their fleets of school buses. House Bill 1255 passed the Maryland Senate and House on Monday. Hogan’s signature would trigger the start of the Zero-Emission Vehicle School Bus Transition Grant Program by this fall. That program, a special, nonlapsing fund held by the State Treasurer, would be implemented and administered by the Maryland Department of the Environment, in consultation with the state department of education. 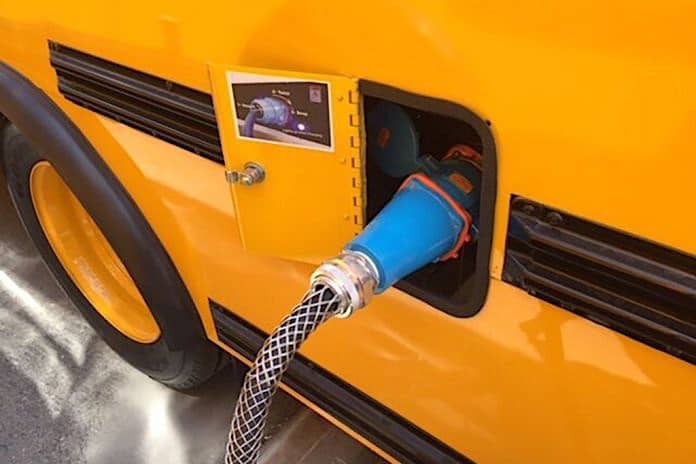 Maryland is eligible to receive over $71 million from the Volkswagen settlement, with $4.6 million designated for replacing older school buses with CNG, electric or propane-powered vehicles. The state’s mitigation plan called for the creation of the $600,000 Electric School Bus Pilot Program to launch four to six ZEVs throughout the state. The goal is to gain experience in how they affect operations, maintenance and budgets. The original bill version that was introduced by Del. David Fraser-Hildago in February, included language that would have required school districts to only purchase ZEV buses by October 2022, and school bus contractors to do the same by 2025. The grant program was developed from amendments in the House last month. If signed, HB 1255 goes into effect on Oct. 1 of this year. A General Assembly synopsis states that county school districts and contractor companies are eligible to use the funds for vehicle purchases and implementation of charging infrastructure. Emails seeking comment that were sent to Fraser-Hildago’s office and several state student transporters had not been returned at this report. But a spokeswoman for the Maryland School Bus Contractor’s Association, which took no formal position on HB 1255, said any implementation of electric school buses should move forward with careful consideration of costs. PGCPS has 13 bus lots located around the district, with between 85 to 165 buses assigned to each. Talbot County Schools said it would likely need to increase its bus fleet size, because of the limited range of electric school buses. It also expressed concern that there would likely not be enough time to fully recharge buses at night for the next morning’s routes. Maryland school districts currently operate over 7,200 school buses statewide.